Understanding how the brain works is critical to developing teaching and parenting strategies for all brains, and for a better understanding ourselves and our children. There is no professional requirement for teachers or child psychologists to study neuroscience or educational law. Little of the huge strides made in the last 30 years in understanding the brain and learning or changes to the child protection laws have made it to those professions. Preparing your children to survive and thrive in the 21st century can seems overwelming at times, especially for children that are under-served by the education system. It is important to understand that most of the developmental assets your child needs can be under your control, although most of us would appreciate school and community support. 4MyLearn is here to help. Some of the concepts initially appear complex and hard to grasp if never thought about, but once you think about it it is obvious. We want to get you thinking. First of all, we are an educational resource community for parents and teachers who want to better understand their children’s learning and rights. Then we are resource to assist in the development of essential skills for effective teaching of academics and behaviors. Finally, we are a community to share facts on who not to blame and ideas on collective change to educational practices or funding as an essential part of the education modernization necessary for the US to remain competitive in the digital 21st century. The guided picture tour of what do we now know about the brain, learning, and the US education system? As with everything else there is diversity in brain architecture. The brain is a wonderfully complex organ, with 1000’s of distinct functional areas made up of 100 billion neurons, connected through 10 trillion connections, using 100’s of neurotransmitters, providing rich diversity. Each brain is unique, highly plastic, dynamically changes over time, but has critical growth periods. 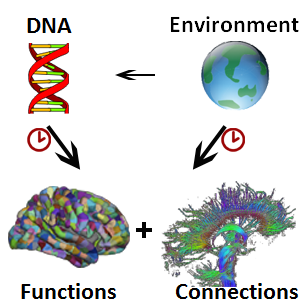 The brain is shaped by genetics and environment. Some gene activitation is affected by the environment. To start with, we will focus on two aspects of diversity which profoundly affect learning: brain hemisphere dominance and local verses global connectivity dominance. Like other social mammals, humans divide their brains in two hemispheres, so that two different thinking tasks can go on at the same time, at different speeds. The fast visual or right hemisphere of the brain constantly scans for danger and performs non-linear critical thinking. 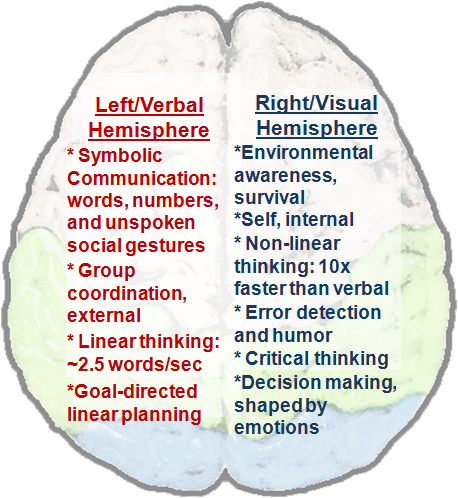 The verbal left hemisphere specializes in communication and linear thinking. The brain only has so much room for connections, so a trade off is made between number of local connections verses the number of long distance connections. 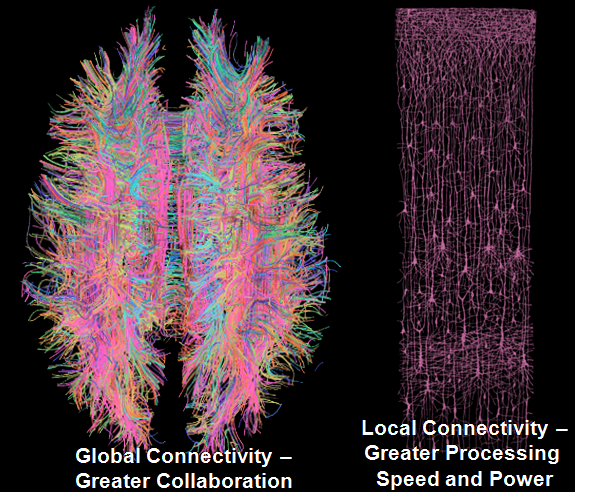 Local connections increase local processing and memory capability, whereas global increases coordination of different processing and memory circuits. Lower than average cross-hemisphere connections are correlated to high IQ. Great scientists, leaders, and artists, such as Thomas Edison, Albert Einstein, Michael Faraday, Henry Ford, Charles Schwab, George Washington, Ben Franklin, Thomas Jefferson, Leonardo da Vinci, Ansel Adams, Pablo Picasso, Walt Disney, Steven Spielberg, frequently have strong right hemisphere and local connection dominance, at the expense of reading and sometimes social communication challenges. What does research indicate that kids need to succeed? Developmental assets which build character and security. Effect of modern lifestyle on the developing brain. Frequently, we embrace change without thinking about and compensating for the negative consequences. Unfortunately, modern mechanized sedentary lifestyles do not provide many activities to strengthen hemispheric connections, as there were in the past. Today, most US children under the age of three have a significant deficiency of a key brain element, Omega-3. The higher brain activity of the right brain increases the sensitivity to the deficiency. The American Pediatric Association recommends that TV and electronic entertainment should be avoided for all children under age 2 and limited to no more than 2 hours a day for older children and teens, because of the abnormally high visual and verbal stimuli. Again, higher brain activity increases the susceptiblity to visual and audio overload, epileptic seizures, and brief losses of consciousness from TV and certain video games. Although the dynamics can grab their attention the over-stimulation effects can be harmful. 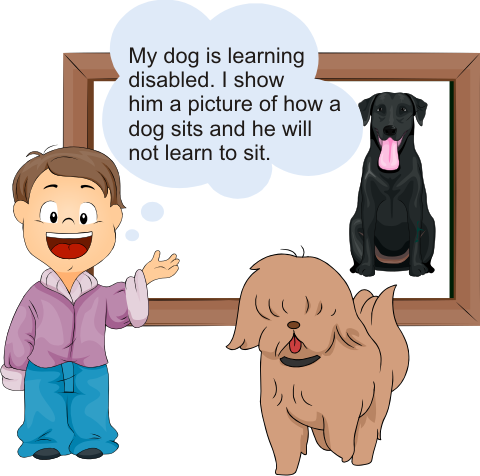 Beneficial child-paced technology adjust audio and visual dynamics to the child's needs. The immune system is a complex processing system tightly coupled to the nervous system. Weaknesses in one system, negatively impacts the other. Both impact development. For more on: What do we now know about the brain, in a nutshell? Ninety-nine percent of all sensory information is discarded almost immediately. What is saved is what the brain judges to be important. Infants and young children need adults to inform them about meaning, in a manner they can understand to start building their knowledge network, otherwise they do not know what stimulus is safe to discard. Failing to do this can lead to sensory over and under sensitivity. Young visual children do not learn meaning through words. They learn by SHOW ME not TELL ME. Hand-over-hand teaching is the most effective for little visual ones. Factual information is stored in semantic memory and requires repeated refreshment to remain in long-term storage. 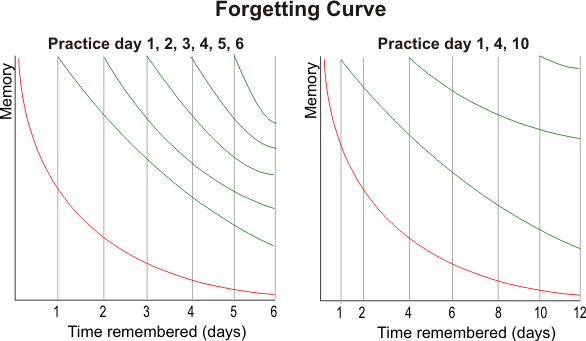 This is referred to as the Forgetting Curve. Daily refreshing of facts is not the best way to retain information. Gradually increasing the time between information refresh is one of the ways of more effective teaching. The human brain is organized to be a pattern detector and reasoner, but less so an applier of provided rules. 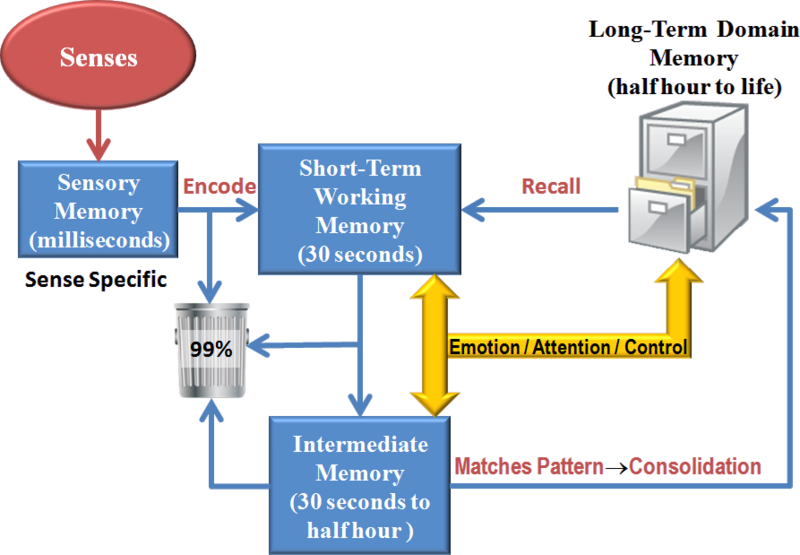 Context rich information is stored in episodic memory with links to semantic memory. The more relevant and the deeper the person thinks about the information, the greater the retention and later recall. Low complexity causes boredom. High complexity or detail with low context causes confusion, which is difficult to recover from. Traditional education provides low context factual information of low cognitve complexity with daily refresh at a single level of difficulty, so student range from bored to confused. 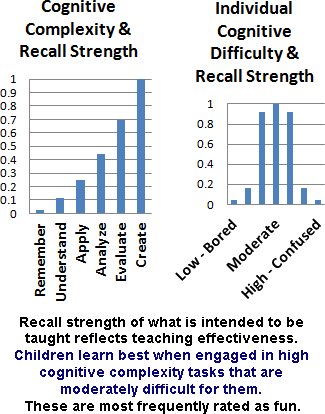 Therefore, recall strength is at the lowest per hour of instruction, and more hours of instruction are needed. For more on: What do we now know about learning, in a nutshell? Government directed mandatory public education was driven by the growth needs of big business at the end of the 19th century, and later the military for WWI. The US was switching from an Agricultural to an Industrial nation. We have moved from the Industrial age to the Digital age. UNESCO, the "intellectual" agency of the United Nations, no longer recognizes the simple set of technical skills for reading, writing and counting as literate. The Common Core English Language & Math, Science, and Social Studies Standards emphasize critical thinking skills and knowledge of key facts necessary for understanding. They are a significant departure over 20th Century education that enables children to have more choices, self-sufficiency, and fulfillment in their adult lives, as well as contributing to solving the major problems of tomorrow. The major problem is that school systems took federal money for nearly a decade to prepare, but teachers were not taught these skills in school when they were young, or taught how to teach these skills to their students. Testing was to start in 2014. Highly rated education colleges continue to teach what they taught last century, even today. So tomorrows teachers will be equally unprepared. 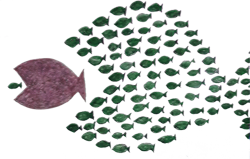 Without outstanding leadership, the larger an organization gets, the harder it is to change. This is true about the public education system, with $600 billion per year revenues. 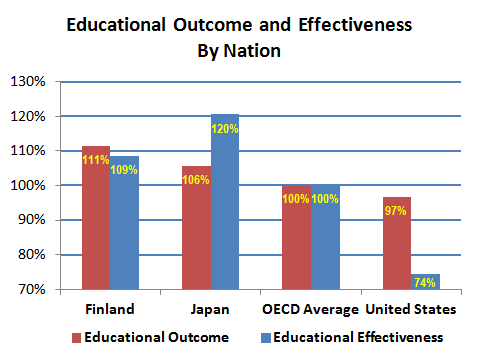 As compared to other nations, the US education system has slightly below average outcome and one of the worse effectiveness. US gifted children's scores are equal to average scores of highly academic nations, like Finland and Japan. Research has found that teaching effectiveness has the largest school impact on academic achievement, but as a higher percentage of educational funding came from state and federal resources, a significantly lower percentage of total funding made it to teachers and kids, from 65% to current 37%. Student academic outcomes did not increase. It has been found that the most effective education includes a blend of high quality human and computer teaching. The two teaching methods can be synergistic, being most effective in different ways. High quality blended teaching has been shown to successfully counteract the effects of extreme environments found in big cities. A culture is shaped by language and cultural institutions. Written language is a set of shared arbitrary symbols that are used to communicate. A person’s ability to learn or communicate through a language depends on how well that person's underlying thoughts or concepts align with the style of the language. World languages come in two forms, visual and auditory. The figure to the right shows the word woman written in two visual languages, Modern Chinese and Ancient Egyptian, and the auditory language, English. Most people in this world speak visual languages, and learn through the natural mapping of visual information to concept meaning. These are "show me" learning cultures. As a language that grew out of multiple sources, English is considered one of the most difficult languages to learn to read and write; with 26 letters, 52 letter shapes total with upper and lowercase, 44 sounds with 150 regular spellings of the sounds and roughly 1000 irregular spellings of the sounds. Learning your ABC's is just one tiny piece. Children from text-based "tell me learning" cultures, like 20th century US, are expected to learn through mapping of acoustic information to concept meaning. Visual thinkers store concepts primarily in visual long term memory. Young visual thinkers can have problems translating the information in acoustic utterances (just sounds) to auditory (sounds with word meaning) to visual concepts, later followed by written text to visual concept meaning. Some do not learn the acoustic utterances. Some learn the acoustic utterances and letter sequences, but not the shared meanings. Current US education system is geared for one type of brain, verbal left brain with moderate global connectivity, which is present in 25% of the students. All students benefit from total brain teaching. About 60% of students are visual right brain thinkers, and rely more on visual right brain learning mechanisms, especially those with less global connectivity. It is estimated that 40% of students are not reading or doing math at grade level. The average child labeled with a learning disablity has an IQ that is average to above average. So they have the ability to learn, but 80% of teachers view them as retarded, because this is what they have been taught. Teacher’s and education researcher's perceptions have a major effect on a child's education. 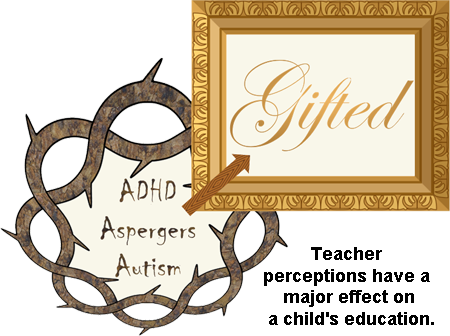 There is a large overlap in behaviors exhibited by gifted, ADHD, and ADS labeled children. Educators are warned to be careful to not mislabel. It so happens that both gifted and ADHD labeled children's cortex mature 2 years later than average. A highly respected education researcher took the nearly identical MRI data from both studies, and concluded for the gifted that later maturation was a benefit that allowed greater adaptablity, whereas for the ADHD, the later maturation indicated a deficiency, propagating the myths that learning disabled children are defective and gifted are superior. The gifted are a group underserved by today's education system that are studied with a positive light. Research that studies effective methods of serving the gifted needs in an integrated school, very often apply to serving the needs of those that are labeled disabled, than those designed to study the needs of the disabled. Functions that occur in your dominate hemisphere are simply easier for you to develop. People often feel that others that struggle with what you view as simple, are inferior, but those that excel in things that you struggle with are superior. Actually, they are only different. What needs to be praised and admired is the effort people take to learn or create. For more on: What do we now know about the US education system, in a nutshell?